If silicone oil causes an IOP spike, endoscopic cyclophotocoagulation can be used to normalize it. • Silicone oil is often used as an intraocular tamponade, but it can cause secondary glaucoma. • In situations in which silicone oil leads to elevated IOP, removal of the oil does not necessarily mean that IOP will return to normal. • Secondary glaucomas can be managed with a drainage implant or with endoscopic cyclophotocoagulation. 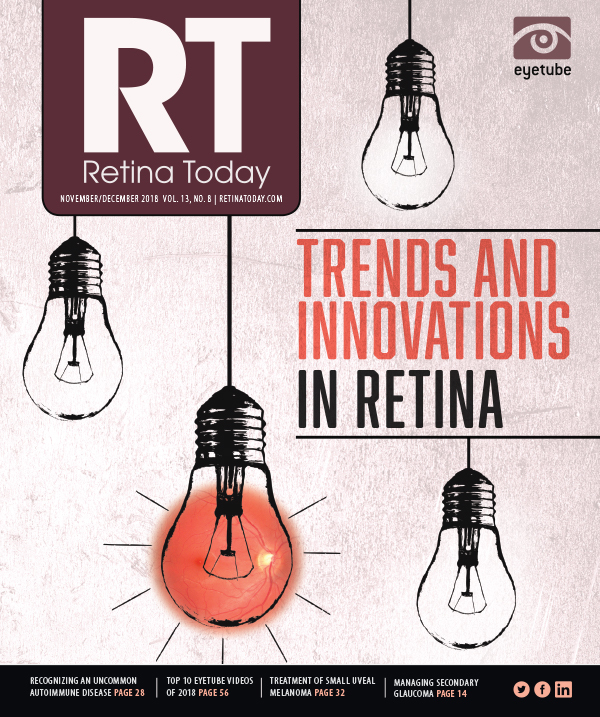 Typically, gas-based tamponade is preferable for closing retinal breaks because it limits the potential for postoperative intraocular hemorrhage and it completely dissipates over time. However, in the presence of complicated detachments, recurrent vitreous hemorrhage, postoperative need for air travel, and other circumstances, silicone oil can be quite useful and perhaps superior to gas. Secondary glaucomas can be managed with a variety of drainage implants or with endoscopic cyclophotocoagulation (ECP), which permits direct visualization and application of laser energy through a 19-, 20-, or 23-gauge laser microendoscope (Endo Optiks Laser Endoscopy, Beaver-Visitec International) to the epithelium of the ciliary processes to reduce aqueous production and thereby lower IOP. 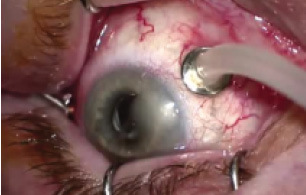 When a patient with silicone oil–related glaucoma presents, the surgeon has a few options to consider. Simply removing the silicone oil will typically not result in lowered IOP. If there are reasons why the surgeon would prefer to leave the silicone oil in place, then a single-port pars plana incision may be made to insert the laser endoscope and laser the ciliary processes. This maneuver is often quite successful and results in a quiet eye with minimal postoperative problems. As with any ECP procedure, the extent of the treatment zone depends on several factors. In this instance, they include the height of the IOP elevation, the number of glaucoma medications the patient is taking, and the mechanism of glaucoma. With silicone oil glaucoma, one must presume that the situation is tantamount to a chronic open-angle glaucoma, in which case extensive treatment would be effective. For example, if the IOP is 40 mm Hg and the patient is taking four glaucoma medications, then performing ECP for 300° to 360° degrees and ECP-plus for 120° to 180° might be required. (ECP-plus is a confluent row of laser applications on the pars plana just inferior to the “tails” of the ciliary processes.) This degree of treatment would likely result in dramatically lower IOP and the need for few if any glaucoma medications postoperatively. On the other hand, if the IOP is between 20 mm Hg and 30 mm Hg and the patient is using one or two medications, then the 300° to 360° ciliary process treatment alone would likely suffice. It is important in these eyes to ensure that neovascular glaucoma (NVG) is not the etiologic mechanism. Ischemic eyes with NVG can be very sensitive to ECP, regardless of the degree of IOP elevation. Performing the aforementioned treatment on an eye with NVG would likely result in hypotony or phthisis. If it is determined that the mechanism of glaucoma is NVG in the eye with silicone oil, then typically 180° to 210° of ECP would be sufficient as an initial treatment and would minimize the risk of hypotony or phthisis. If there is some technical reason why it would be beneficial to remove the silicone oil, then the surgeon can perform this portion of the procedure either before or after ECP. The IOP outcome after ECP appears to be independent of silicone oil removal. A recent case of silicone oil glaucoma treated by ECP (Video) can help illustrate some pearls for surgeons interested in adopting this technique. In this case, after removal of a large portion of the silicone oil, many emulsified droplets remained overlying the pars plana, ciliary processes, zonules, IOL implant, and posterior iris (Figure 1). Despite the presence of these droplets, the laser endoscope was directed toward the processes, and laser was applied in a continuous wave fashion, painting the surface of the ciliary processes around 300° degrees (Figure 2). Care was taken not to photocoagulate the posterior aspect of the iris, nor to overtreat the processes, which can result in tissue explosions. When the treatment was completed, a uniformly white band of photocoagulation lesions incorporated the face of the ciliary processes, contrasting with the undisturbed brown epithelium of the posterior iris and pars plana. Figure 1. 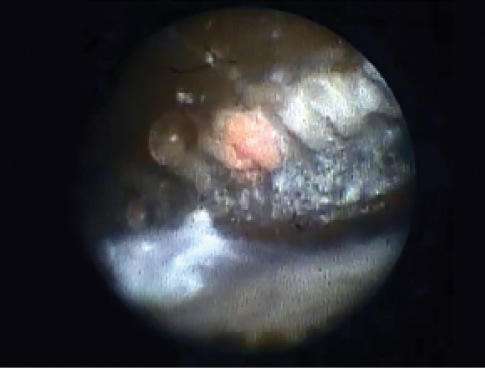 Endoscopic view shows silicone oil droplets on the ciliary processes. Figure 2. Laser application is targeted to the ciliary processes under direct visualization. When we are faced with a patient with uncontrolled silicone oil–related glaucoma, ECP affords us the opportunity to treat the glaucoma simply, without the need for tube implantation and its attendant difficulties and complications. ECP also gives us the option of leaving the silicone oil tamponade in place. 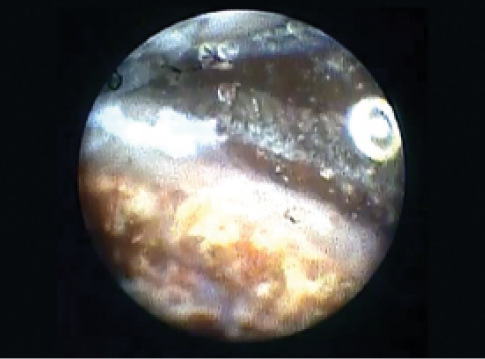 ECP via endoscopy is a valuable tool in many scenarios, and treatment of silicone oil–related glaucoma is one more area that surgeons with access to this technology may want to adopt. 1. Madanagopalan VG, Velis G, Devulapally S. Emulsified silicone oil droplets in the canal of Schlemm [published online ahead of print March 2, 2018]. Int Ophthalmol. 2. Fang Y, Long Q, Wang X, Jiang R, Sun X. Intraocular pressure 1 year after vitrectomy in eyes without a history of glaucoma or ocular hypertension. Clin Ophthalmol. 2017;22:2091-2097. 3. Liu Z, Fu G, Liu A. The relationship between inflammatory mediator expression in the aqueous humor and secondary glaucoma incidence after silicone oil tamponade. Exp Ther Med. 2017;14(16):5833-5836. 4. Ichhpujani P, Jindal A, Katz JL. Silicone oil induced glaucoma: a review. Graefes Arch Clin Exp Ophthalmol. 2009;247(12):1585-1593.